« Donald Trump and Hillary Clinton: The Tweedledee and Tweedledum of Statism? I realize that there are important issues to analyze, but it’s utterly depressing to focus on Trump’s protectionist agenda or Hillary’s redistribution agenda. So let’s escape the dismal reality of American politics and enjoy some laughs about Britain’s glorious decision to escape the sinking ship of the European Union. We’ll start with a parody video featuring the head of the National Socialist Workers Party (PG-13 warning that there are some naughty words). Not let’s enjoy some more clever satire. 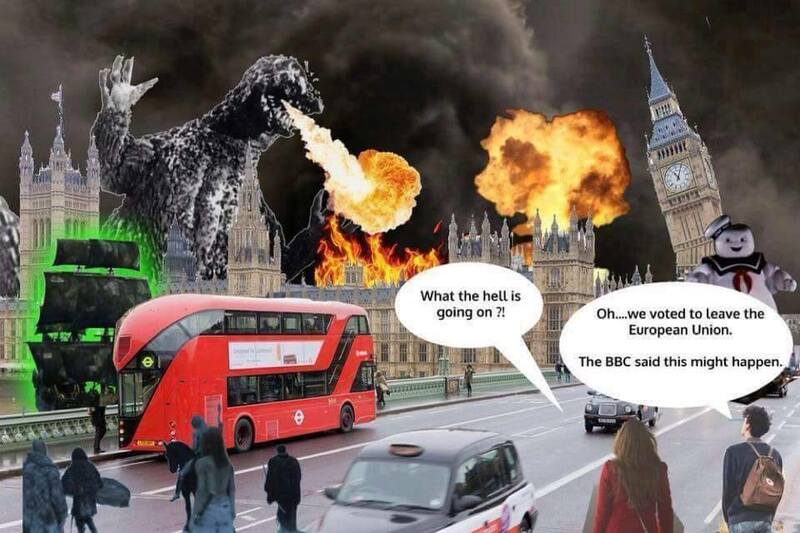 We’ll start with this depiction of what was supposed to happen according to the statist practitioners of Project Fear. 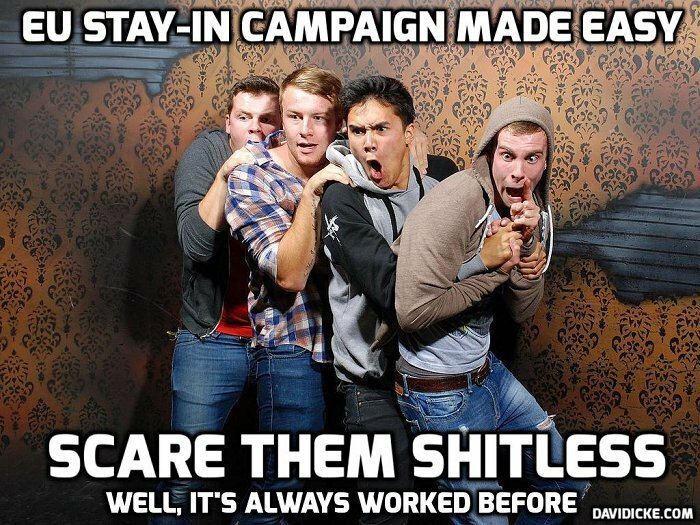 Speaking of Project Fear, here’s some related humor. 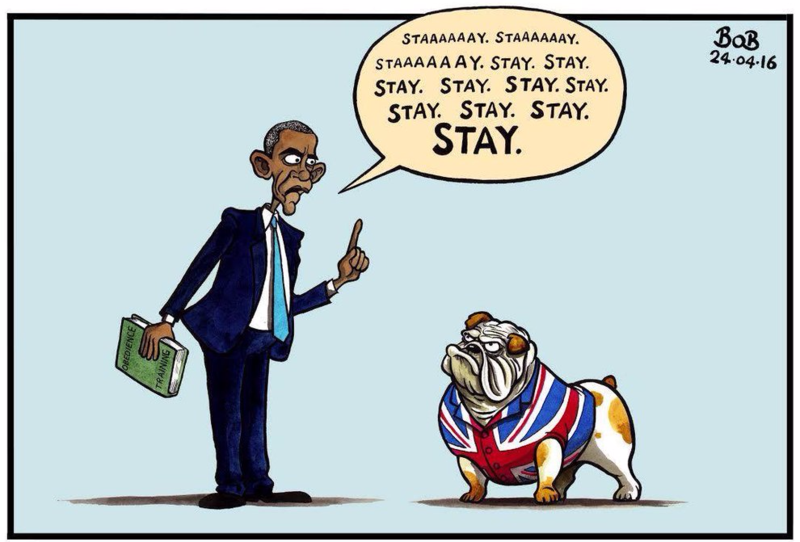 And I very much enjoy this cartoon showing that Obama’s attempt to convince Britons to remain in the EU was about as successful as his efforts to convince Americans to like the failed Obamacare program. Last but not least, I can’t resist sharing this image since I’ve repeatedly used the escape-from-a-sinking-ship metaphor. Hitler isn’t in this video about the Clinton emails, but it’s got a Nazi theme so it belongs in this group. P.P.P.S. This is sad rather than funny, but here are examples of government-created human rights in Europe. Similarly, if you compare bizarre statements and behavior from the two leading bureaucrats at the European Commission, you’ll understand why the Britons were wise to escape. Dan, much of the world seems to be falsely trying to equate Nazi with right-wing, so it would be good for you to clarify that Nazi is the abbreviation for NAtional soZIalistische – National Socialist. The Nazi party’s full name is NAtionalsoZIalistische Deutsche Arbeiterpartei – the National Socialist German Workers’ Party – which makes it clear that Nazi is actually the Socialist Workers’ Party, a very left-wing name.